Posted this on Facebook last November, but thought I'd share here as well. This day of racing convinced me to buy an Aero. That's me to the far left in the pic, tacking immediately after the start. 38 Standard and Radial Lasers vs. 1 RS Aero 7 in 12-3 knots. NW breeze with big phases, holes and puffs; mostly WL courses, except one double-Harry Anderson (look it up). I was hobbled by a top batten that was too tight, making run-to-run gybes pretty much impossible in the light air and thus limiting tactical options downwind. Since the rest of the fleet was racing "for real," I started at the unfavored boat end of the line in all but one race, tacking immediately to stay out of the way. Rarely was this the right way to go, but the Aero's quick acceleration and option of high or low modes meant I rarely rounded the weather mark out of the top 3. The Lasers seemed to go by-the-lee better than the Aero, which accelerated faster in puffs and favored less windward heel. The Aero seemed a bit more sticky in traffic but generally held its own on the runs. The committee set pretty broad first reaches on the one double Harry Anderson course, but the second reaches were on the beam and really showed off the Aero's light weight, excellent blades and superb acceleration. The poor Lasers didn't have a chance and I pulled out to a commanding lead, despite hitting very light winds on the final beat to the finish. Between races I let a few people try out the boat for a few minutes. Everyone enjoyed the boat's light responsiveness and comfy hiking position. 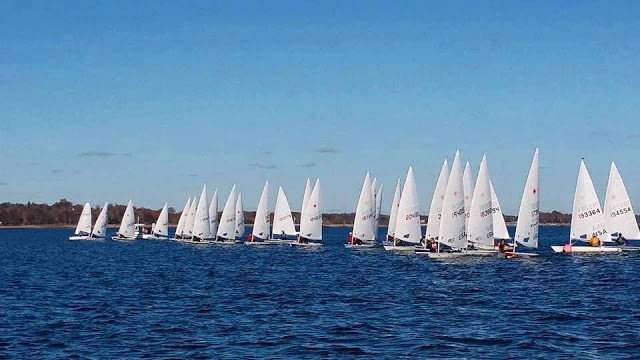 On yeah: in my second time in the boat, starting at the unfavored end, racing against the 2012 US Laser Olympic rep and other fast locals, my on-the-water scoreline was 2-1-1-1-1-1. Captain Su is a nom de plume for an expat Aussie currently living in Bali, Indonesia. From 2011 to 2013 he worked as a journalist for the Bali Advertiser, News stories from his column “From the Sea” are included here courtesy of the Bali Advertiser.